Prophecy Records knows what underground metal fans of discerning taste will enjoy. Its owners, whoever they are, understand that we won’t always be in the mood for Forest Poetry, though albums that shy away from relentless sonic atrocity must nevertheless still possess the all-important attributes of power and honesty listeners of our mindset require. Enter the artist Vàli, a Norwegian acoustic/folk musician that delivers quiet, yet highly emotional instrumental music via a muse that somehow feels familiar to the extreme music seeker. On Skogslandskap, a beautiful canvas of melody, melancholy, hope, and sadness is submitted for the undoing of our steel-stitched and -bloodied hearts. Vàli’s weapons of choice are acoustic guitar, violin, piano and flute – no electric accoutrement or percussion here. And, for succeeding as they do, together, in bringing the soul through a flurry of feeling without bogging down into torturous New Age ennui, the sense that at the album’s heart lies a man tormented yet wistful is inescapable, and lends this work of art a heaviness all its own. 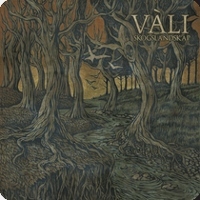 And Vàli’s genius lies not only at the composition, but at the packaging and timing of the effort as well. The cover art perfectly conveys a woodland/natural sensibility appealing to the black and pagan metal hordes. The brevity of each track (all but one song comes in under four minutes) grabs the chin of the attention-deficit and never releases its grip, as each movement appears and disappears so quickly that a palpable longing for more echoes after every listen. That specific longing, or rather, hollowness, can only be filled by a repeat play of Skogslandskap. I fully believe that was Vàli’s intention, for how else can an artist achieve peace, when the drive to connect via creation is the salve that art boils down to? The panacea for any musician can best be described as this one certainty: that his or her captured moment will be experienced by the intended audience again and again. ~ by cliftonium on September 18, 2013. This entry was posted on September 18, 2013 at 6:53 pm and is filed under ALL REVIEWS, V-reviews.You can follow any responses to this entry through the RSS 2.0 feed.You can leave a response, or trackback from your own site.